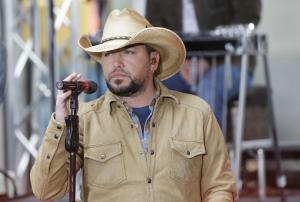 April 28 (UPI) — Country music star Jason Aldean’s Rearview Town is No. 1 on the U.S. album chart. Coming in at No. 2 on the Billboard 200 is Cardi B’s Invasion of Privacy, followed by Breaking Benjamin’s Ember at No. 3, The Greatest Showman soundtrack at No. 4 and John Prine’s The Tree of Forgiveness at No. 5. Rounding out the top tier are The Weeknd’s My Dear Melancholy at No. 6, XXXTENTACION’s ? at No. 7, Migos’ Culture II at No. 8, Black Panther: The Album, Music From and Inspired By at No. 9 and Pentatonix’s PTX Presents: Top Pop, Vol. I at No. 10. Aldean, 41, was named Entertainer of the Year at the 53rd annual Academy of Country Music Awards ceremony in Las Vegas earlier this month.